My constant companion — note the reading on the odometer, which records my total kilometers walking since May 20. Yesterday I walked the last stage of the Via di San Francesco and I’m definitely feeling bittersweet as I hang up my hiking boots for the summer. I’m glad the primary research for my guidebook, The Way of St. Francis, is now complete, but I know I’ll miss Italia. I leave for Seattle in two weeks, saying goodbye to this warm and rich country I’ve come to love. As I walked each day I held in my right hand the little device on the left — a Garmin Oregon 650 GPS, given me as a farewell gift by the kind folk at First United Methodist Church of Seattle. It tabulated each days’ journey into the total for the whole trip — 845.2km (525 miles). Thanks to the Garmin I was able to record my tracks, so now I have GPX files to share with other pilgrims to help them find their way. In my left hand was my other companion — my iPhone 4s — which I used for dictation of walking notes. I ended up with 41 separate audio files for something around 16 hours of notes, which I transcribed each evening after I walked. These all were distilled into twenty-nine chapters of walking descriptions for 32,100 words. Each writing stage, checked off when written. Clothing-wise: I brought my favorite pair of hiking boots with me which unfortunately will not make the trip back home. They already had about 400 miles on them and were growing bald with age (like their owner). After I bought it in Vienna I wore my fluorescent yellow running shirt almost every day, along with the North Face hiking shorts I brought with me — the best shorts I’ve ever had (cool, stretchy, quick-dry). I almost never used my rain jacket or black, quilted North Face jacket — just too warm here. Thanks to the loan of a great Sony camera by Robin Werner I’ve recorded the experience in 2,156 RAW-format photographs. It’s taken all the storage available on my laptop, but some of the pics are pretty good and will form the visual core of the upcoming book. One of the best parts was walking with two people I enjoy. I walked from Santuario della Verna with Jacqueline Zeindlinger of Austria, part of our 2011 camino family and a big help in various aspects of this project. Then on July 15 I was joined by Theresa Elliot and we had two weeks of fun as we walked from Spoleto to Rome. I’ll never forget Theresa, dangling between the iron bars at the cupola atop St. Peter’s Basilica. 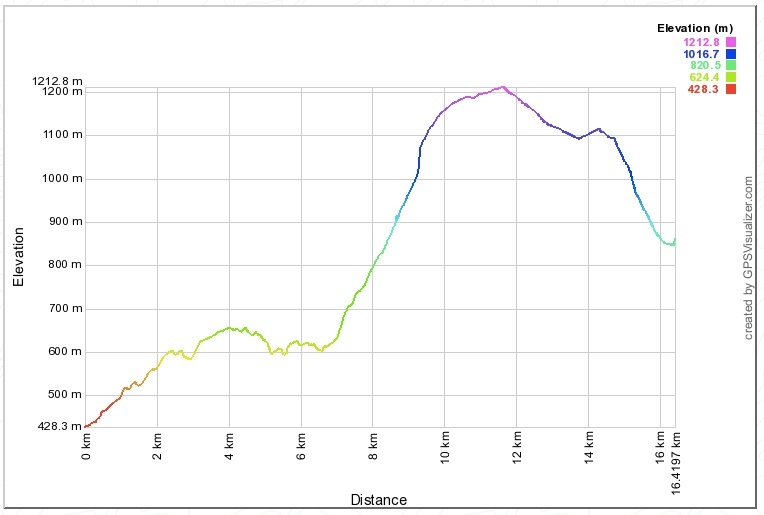 Elevation profile of yesterday’s walk — 800m climb. This was a tough walk. Tougher than the Camino de Santiago. Yesterday was an 800 meter (2600 ft) climb, and most every day of the first six includes climbs like this. Future pilgrims need to know that this is not for the faint hearted. All told, though, I’ve loved it — every moment of it. This summer I’ve learned some basic Italian, I’m gotten into decent physical shape, I’ve met new and interesting people, I’ve lived in a charming foreign country for a few months, and I researched the basis of a book that I hope will be helpful for pilgrims who follow after me. The best part has been digging into the geography and culture of this amazing country. I love Italy and I know I’ll be back. Over the next couple of weeks I’ll flesh the book out by adding helpful and interesting information about each of the places mentioned in the walking guide. When I get back to Seattle I’ll complete the introduction, sort my photos, draw my maps and then, by December 31, submit the corpus to my publisher. But first, I’m accepting the invitation of a friend to visit his family in Catania, Sicily, and on my way back I’m stopping in London to meet my publisher. Two weeks from today, God willing, I’ll land on the tarmac at Seattle and see my favorite walking companion, Theresa, plus my boys and family, for a happy reunion after a summer of walking, work, walking, learning, walking, and adventure. 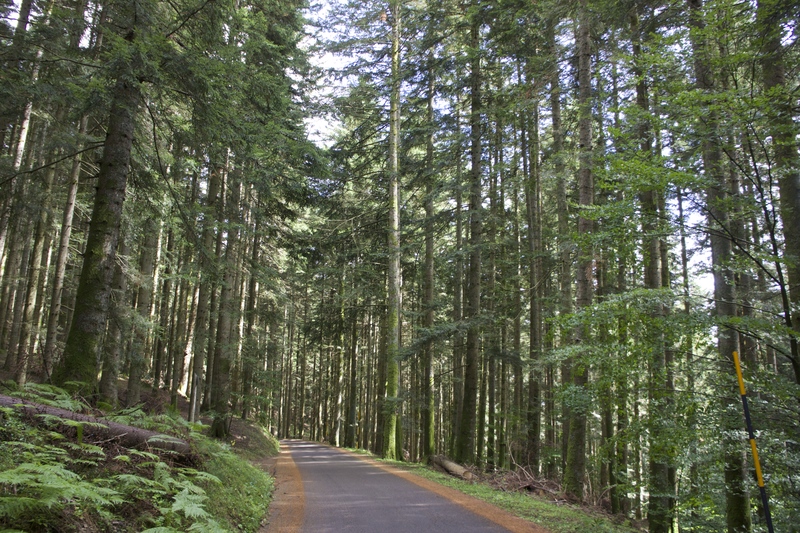 One scene from yesterday’s walk in the Parco Nazionale Foreste Casetinesi, to the Hermitage at Camaldoli. Your book is going to be wonderful! Great post. Love reading the numbers and seeing the elevation map! xxo. How was the elevation(s) generated? Thank you. There are online sites in which you import the GPS track and they provide the elevation profile. I usually use http://www.gpsvisualiser.com for mine. Hey, I haven’t forgotten about your proofreading offer . . . .
I’d be happy to proof read too. As you know I’ve already written a Camino book – THE WAY, MY WAY – and before sashaying into making movies I worked for 12 years as a journalist at the Australian Broadcasting Corporation. I have a keen eye for typos and grammaticals! …oh, one more thing. My proofreading offer has a string attached to it! When-and-if you are satisfied with my work–if it is alright with you when I am done–I wish to have an autographed complimentary copy of your Guide. Am I asking too much? Do we have a deal? congratulations on completing the pilgrimage, and for the work you’ve done. This next phase of writing and collating I’m sure will not only be enormous fun, but will bring back wonderful memories. Your book will be an invaluable resource. Congratulations Sandy on completing a major accomplishment in your life. You have done a great service to your fellow peregrinos! You have taken some beautiful photos and have wet my appetite. I look forward to reading your guide book and taking it with me on my Via di San Francesco. I am currently planning on the month of June 2015. Will your book be published by then? Congratulations Sandy, what an accomplishment! How I wish your book was already in print. 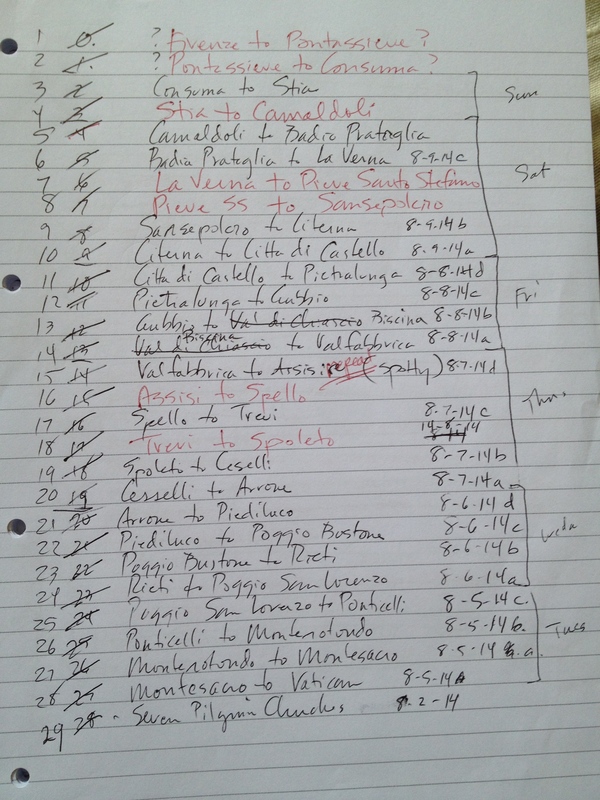 As I wrote to you earlier, I am attempting VF Assisi to Rome with 11 women friends beginning on 18 September. A comparison of our itinerary and yours says they are almost exactly the same. Would love your comments regarding the toughest legs and the availability of transport between towns would be very much appreciated. Pity you will have left Poggio before our visit there, would have liked to meet you. Best of luck with the remainder of your task, getting in to print.